HyperCam version 2, a product of Hyperionics, is now offered free for world-wide usage, both for private use and commercially. HyperCam supports text annotations, sound, and screen notes (great for creating automated software demos and software training!). You can also select Frame rate and compression quality prior to recording your movie. 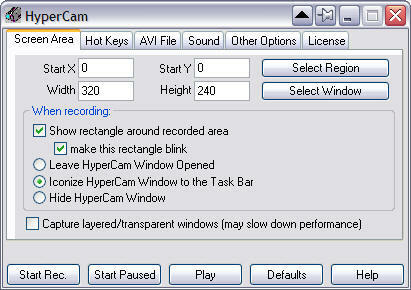 HyperCam v.2 is compatible with Windows 8 and 7, Windows Vista (32 and 64 bit releases, XP and 2000.